Following my previous post detailing the amazing story of Susan Shentall – this time TWO young ladies who again made just one film. Nothing like such a big film as Susan Shentall appeared in but I am sure just as memorable to these two. This is a film that I was not at all familiar with. It is an early version of the story we later would know as The Parent Trap with Hayley Mills but this featured identical twin girls – and they were Yolande and Charmian Larthe. In the later film Hayley Mills played both girls with clever split screen filming but in this the first version of the story, they did not need to use such a technique. 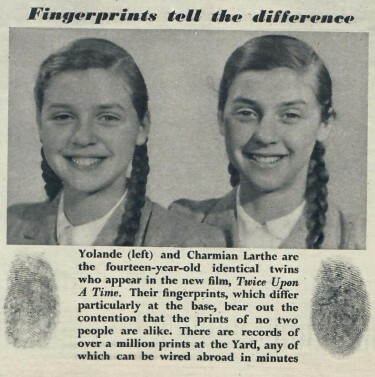 The picture above is scanned from the magazine Illustrated from November 1952 – however the caption with the picture centres on the fact that they are clearly identical but their fingerprints are noticeably different. Back to the film itself – Twice Upon a Time is a 1953 film, directed by Emeric Pressburger based on the book Lottie and Lisa by Erich Kästner. It concerns twin sisters who are separated when their parents divorce and meet again by accident when they are sent to the same summer camp – and they hatch a plan to reunite their parents. Lotte and Lisa had already been adapted into the films Two Times Lotte (1950) a Germany Production. Twice Upon a Time was the first English-language film adaptation of the story. Emeric Pressburger as we all know collaberated with Michel Powell who directed the films they made together - some of the very best films this country has ever produced. Michael Powell I once heard being interviewed about his first meeting with Emeric Pressburger - it was at a ’round the table meeting – in advance of the making of The Spy In Black. Sitting around the table was Michael, Alexander Korda, the Author of the book that Emeric had adapted for the film, and Emeric himself. Korda introduced Emeric and ask him to go over the screenplay he had written which he duly did. Apparently he had turned the original story on its head – the author was not happy – but Michael Powell thought that it was brilliant. He then thought ‘ I must work with this man again’ – which we all know he did. This film, however, was Emeric’s debut as a Film Director in his own right. He never directed another film, so maybe he thought that it didn’t suit him – I don’t know. The film Twice Upon a Time starred Hugh Williams and Elizabeth Allan – she appeared on Whats My Line as a panellist very occasionally in the early to mid fifties. Hugh Williams had a long career both on stage and screen. He played in Hollywood in Wuthering Heights in 1939 – and the very next film back in England was Dark Eyes of London – a film that, for some reason, I do remember from Television years later – it starred Bela Lugosi who must have come over to England to make this one – I had not realised that before. After the War Hugh Williams had a leading part in the lavish Korda production of An Ideal Husband in 1947. Then he was in The Holly and the Ivy in 1952 – another of my favourite films. Throughout most of my childhood my father, the actor Hugh Williams, was working in drawing-room comedies in the West End, some of them written by him and my mother, Margaret. In those days, French windows were de rigueur in the theatre, the way dry ice is today. He would get home around midnight and one of my earliest memories is of him getting me up to ‘pot’ me. He’d sit on the floor beside me with his tumbler of whisky, chatting. Sometimes he’d do magic tricks. He smelt of theatre, of greasepaint, tobacco and Trumpers hair oil (honey and flowers), and was at his most genial, so I soon learnt to hold back my pee to prolong the secret time with him. As I grew older I would drink copiously at bedtime so I’d wake up for our midnight tryst. He’d have cold roast beef and claret, and I’d have a bowl of cereal. ‘It was a good house tonight,’ he’d say, ‘packed.’ With the hours he kept, I thought he must be a burglar. When I was old enough I was allowed to see him at work. There he was, wandering about the stage in his usual clothes, speaking quite normally, giving people drinks and kissing women who weren’t my mother. Money for old rope – all you had to do was take your glasses off. In his dressing room I liked to watch the ritual of his preparation. With The Archers on his Roberts radio and his deaf dresser polishing his shoes, he’d rub greasepaint into his face and darken his moustache. When they called ‘Beginners please,’ he’d finish his Bell’s whisky and stub out his Craven A. When I summoned the courage to tell Dad I wanted to follow in his footsteps, he was seemingly distraught and said he’d cut me off without a penny. I asked, with due respect, how that was possible with him being an undischarged bankrupt. After a longish pause, while my heart was thudding, he began to roar with laughter. Two years later he wrote a part for me in his new play, His, Hers and Theirs, and we set off around the country on a pre-London tour. After the show we’d sit together in stage-door pubs till closing time – it was as if I’d been practising the late-night drinking with him since I was two.